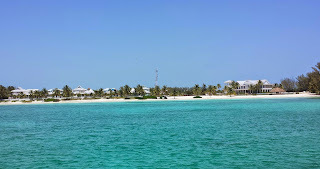 We are anchored off Chub Cay, in the Berry Islands (map). Chub is an oft-used stopping point on the main cruising route from south Florida to Nassau. We had seven neighbors last night, and so far another three tonight. Earlier today we were all alone in the anchorage. The anchorage is just off the entrance channel to the Chub Cay Club marina, part of an on-again, off-again "resort" development on the island. The island is "private" and our chart/guidebook says it is not even permitted to land a tender. Nevertheless, we called ahead and asked if we could have dinner in the restaurant, and it turned out to be no problem. The beach at Chub Cay. Unfinished "clubhouse" is to the right. The buildings to the left are private "cottages" in the development. The marina is behind all these buildings. At first blush, from the anchorage, it all looks very high-end, backing up the claim that it's all private and exclusive. Looks can be deceiving, however. But first, we needed to get anchored, which was more of a challenge than we had expected. We had a flat calm crossing. The route from Nassau crosses deep water where the Tongue of the Ocean meets the Northwest Providence Channel, and it can be rough enough that boats will wait here or in Nassau for days until the weather settles for the voyage. By luck of timing, we had virtually no wind, and waves of just inches the whole way across. Unsurprisingly, then, the anchorage here was even calmer when we arrived. But with three sailboats already here and occupying the "good" spots, we had to squeeze in just at the very edge of the channel. Or so we thought, based on what our chart said the depths were closer to shore. After getting the anchor set and the boat squared away, we splashed the tender, in anticipation of going ashore for dinner. As long as the tender was down, I did a quick run around the anchorage to sound it out. I found depths higher than charted throughout, and plenty of room for Vector a bit closer to shore. No sooner had I returned with the depth report than another motor yacht arrived, and dropped the hook right next to us. By the time they were set, they were sticking out into the channel by a half boat length. 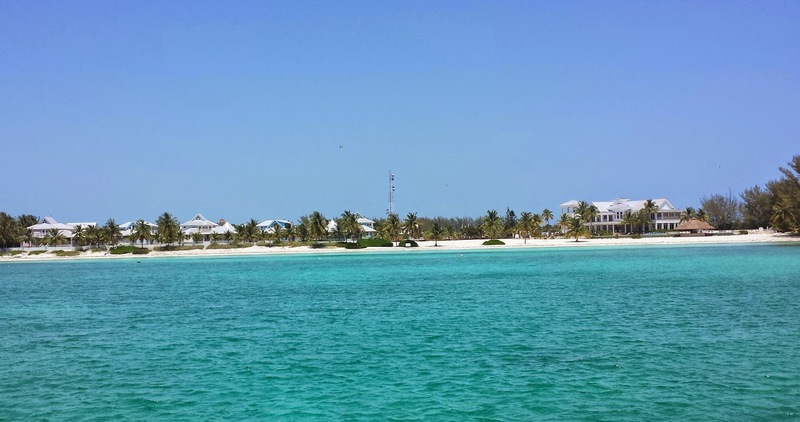 I should mention here that Chub Cay Marina is something of a sportfishing destination, and larger sportfishers come and go through this channel at all hours. The marina also accommodates yachts in the 150'+ range, and we found three of those berthed when we went ashore. Fortunately, they did not encroach on the nice spot I had already picked out in the tender, and we weighed anchor and moved a hundred yards or so, leaving the newcomer by himself. The move seemed prescient when, a short while later, the marina hailed him and asked him to get his boat out of the channel. The restaurant serves dinner from 6:30 on, and we rode over in the tender just at opening time, marveling at the enormous yachts in this remote marina, and tying up at an open T-head near the office. All around us were the trappings of hoped-for opulence that is yet to be. It reminded us a lot of Emerald Bay, where no expense was spared, right up until the money ran out entirely and things were left half-done. For example, one might expect the restaurant to be in the luxurious-looking and seemingly brand new "club house," the one with the infinity pool and the swim-up palapa bar. But that building has never been finished and is not open; the infinity-edge on the pool is crumbling away and the water level does not reach it, and there is no bar tender nor any stock at the swim-up bar. The restaurant was, instead, in a building that looks like it has stood unchanged since 1979, with furnishings to match, staffed by the surliest Bahamians we have yet to encounter. We're inured to Bahamian prices now, so a $100 dinner check for our simple meal was no surprise, but we've had better meals in more remote islands for half that price. In keeping with the sportfishing theme, Louise was the only female in the joint, although there were three other tables of boaters while we were there. As if to remind us that we were, indeed, in the Bahamas, the power went out in the middle of dinner. After dinner we walked around the property, whereupon we discovered the aforementioned crumbling pool, seldom cleaned, with the abandoned palapa bar. We met a nice family there who had docked their sailboat to check in to the country; chatting with Cory, Jessica, Colby, and Payton was a high point of our shore visit. Next to the pool was an empty hot tub with a few inches of foul water at the bottom, unused and uncared-for in a long time. The most well-kept feature of the pool area was its numerous signs proclaiming the rules. Vector as seen from the pool area. 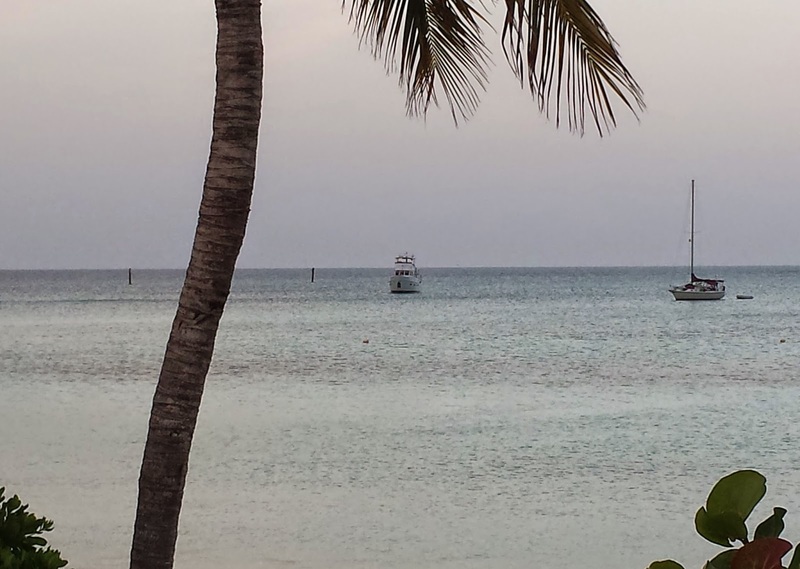 Some day we hope to return to find the swim-up bar in full swing, the quaint Bahamian-style cottages around the marina fully sold, and the marina store fully stocked. In the meantime, it's just more evidence to support my friend John's claim that the Bahamas is a parallel universe. Still, we are glad there was still a going concern here, and we enjoyed our dinner ashore. Now that we've crossed the "big water" (well, most of it, anyway), we can slow down a bit, and as long as we were in a nice anchorage, we thought we'd just spend another day here. We even thought we might dinghy the six miles around the island to the Berry Island Club to check it out as well. But as we returned from dinner, a swell was coming in, one which got progressively worse as the night wore on. The motion was putting me to sleep, and I went to bed early. We awoke to more of the same, and by the time I came upstairs, all the other boats in the anchorage were leaving in a conga line. We contemplated doing so as well, but our next anchorage will be mid-bank, with even less protection. Instead, we took advantage of the newly-vacated "good" spots to move even closer to shore, which reduced the motion quite a bit. We dropped the hook in a more tolerable spot. I spent a good part of the day getting usable charts loaded on the main plotter, an exercise I documented in my last post. And we made a bit of progress getting the boat squared away for guests. Louise has been working on remediating various rust stains around the boat, and when she was finished for the day we both jumped in for a swim. I donned mask and snorkel to check on the boat, and found all to be well. We had taken out a steak this morning to grill for dinner, but when I went to put it on I found the grill ice cold. Hmm -- tripped breaker. I reset the breaker, and ten minutes later the grill was still cold. Not good. 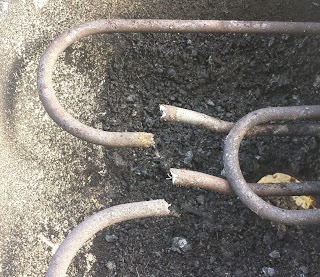 After lifting the grate I found the heating element broken in two. Apparently, there is a critical system for which I do not have a spare. Louise Tweeted it, and she's been getting replies along the lines of "abandon ship." We made do with pan-frying the steak; we no longer have a broiler since I replaced the oven with a dishwasher. I will order a replacement element and hope that our friends can get it into the country with them on the ferry. A good part of our planned menu while they are aboard involves grilled items. 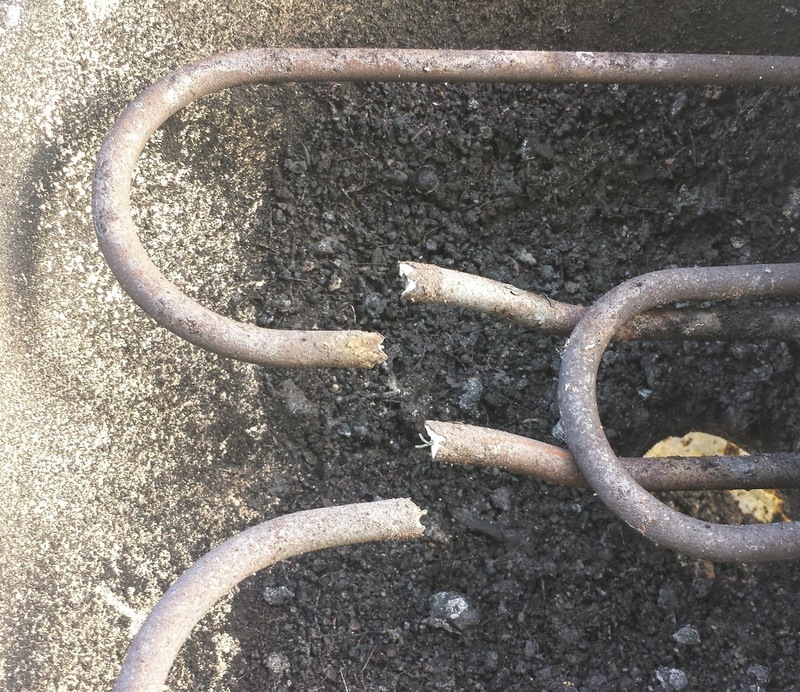 I suppose this is what I get for using a household grill rather than something "marine rated." Still, I am very happy with our Weber and would not trade it for any of those marine grills, even if they were the same price. They're not, of course, and I can buy a new element or even a whole new Weber every two years for a looong time before I reach the cost of an electric "marine" BBQ. But, really, food on the Weber just tastes better. I am no expert on the Bahamas, this anchorage, or, really, anything else related to boating. But sometimes just being a day ahead makes you the go-to guy, and two of the three boats that arrived in the anchorage this afternoon called me on the radio for advice. When it got rolly, we tucked well in to the shore, having already sounded it out. The water here is just 7' deep at low tide, which right now is still over a foot above datum. If we stayed here another two weeks, we'd be on the bottom. But the chart says it's just over 5' here, so it is understandable that folks would call and ask for soundings. The two monohulls originally anchored out much closer to the channel, where we ourselves had started out, and from our deck they resembled nothing so much as metronomes, their masts scribing arcs of some 30° or more in the sky. We told them what we found with our tender soundings, they both moved up a hundred feet or more, and both are now much more comfortable. I'm still not the expert, but it felt good to be able to help out. Tomorrow we will weigh anchor and move along. From here we have a 75+ nautical mile journey to Cat Cay. That's more than a day for us, so we will anchor somewhere in the middle, in open water on the Bahama Bank. I expect it will be rolly, but nothing we have not seen before. The first 15nm is in deep water, part of the Northwest Channel known as "the pocket." After that we will be on the shallower waters of the bank, with some protection afforded by the Berries and Andros as we move west. I expect we will be out of range of any cell tower tomorrow night, so this is probably the last you will hear from us until we reach Cat Cay sometime late Tuesday or so. I will try to post a map link from our Spot messenger from the bank tomorrow if I can not get on line.